AVL-DRIVE 4™ - The tool for objective driveability assessment and development extends the capability of objective driveability evaluation from road to rig, to lab and to office. Ideal for defining the brand DNA, setting targets and monitoring the evolution of development within existing company processes up until final acceptance. How to manage trade-offs between affordable CO2 measures and positive driving experience? How to target market- and brand-specific driveability expectations? How to keep the vehicle attributes recognizable in hybrid vehicles? How to achieve an attractive cost-effectiveness with technologies of the future? How to track the quality and progress of the development? How to define development targets and the own brand DNA? 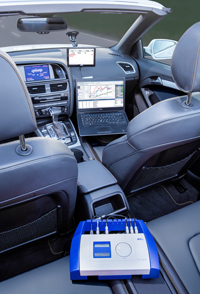 The AVL-DRIVE solution package consists of comprehensive services like objective vehicle benchmarking and target setting, thorough vehicle analysis including presentation and reporting of modifications and improvement potential, the support of driveability development and calibration, the integration of OEM-specific criteria and assessment algorithms as well as system integration in the customer test field, as well as testing, validation and acceptance procedures. The AVL-DRIVE software is available for applications with regards to Driveability, Handling, Ride comfort and ADAS. Objective real-time assessment provides instant feedback on driving attribute quality. Fast driving attributes assessment in combination with automatic report generation encourages target-driven development and eases the alignment between different skill teams. Common language between management, development areas and within the supply chain. Reproducible assessment of driving attributes based on measured physical values. Clear description of vehicle characteristics. AVL-DRIVE™ for all phases and environments during the development process - from pure math to on-road vehicle testing - supports a frontloading approach and thereby reduces the number of prototypes.